I guess that this recipe tried to teach me a lesson: nothing worse for a perfectionist/control freak like me to realize that no, I won’t be able to shape all the cookies the same way and yes, some will be tiny and others will be huge. 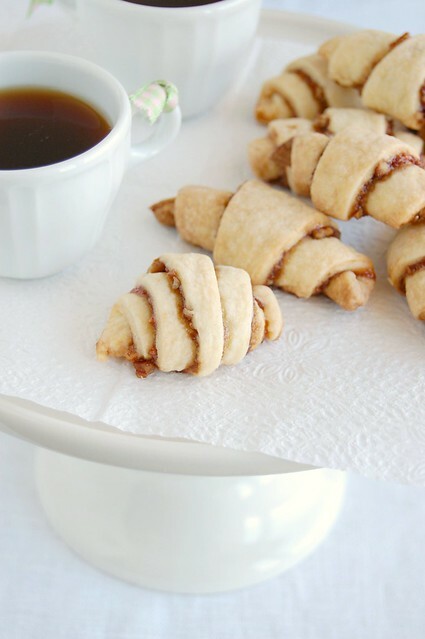 At least I waited for a cold day to make these (after the other rugelach fiasco) and despite the problems with the rolling and shaping of the cookies they turned out delicious – the cocoa and pecans work beautifully with the raspberry jam and the dough is so tender and flaky it resembles puff pastry. In the large bowl of an electric mixer, beat the butter and cream cheese until evenly combined, scraping the sides of the bowl once or twice. Beat in the sugar, vanilla, and salt. Reduce the speed to low. Add 1¼ cups of the flour and mix just until incorporated, then repeat with the remaining 1 cup of flour. Do not overmix. Turn out the dough onto a lightly floured work surface. Flour your hands well and gently knead to be sure that the ingredients are evenly distributed, about 10 seconds. Divide the dough into thirds. Shape each portion into a 2.5cm (1in) thick disk and wrap each in plastic wrap. Refrigerate until chilled and firm, about 2 hours. Filling: combine the pecans, granulated sugar, brown sugar, cocoa, and cinnamon in a small bowl; set aside. Preheat to 180°C/350°F. Line two large baking sheets with foil. Working with one disk of dough at a time (keep the others refrigerated), unwrap and place on a lightly floured work surface. Sprinkle the top of the dough with flour, and roll out into a 32cm (13in) diameter circle. Using a small offset metal spatula, spread with about 2 tablespoons of the preserves, leaving a 2.5cm (1in) border around the edge. Sprinkle the jam with about 2 tablespoons of the filling mixture. Using a sharp pizza wheel or large knife, cut the dough into quarters, then cut each quarter into 3 wedges, to give a total of 12 wedges. One at a time, starting at the wide end, fold the corners in about 6mm (¼in) and then roll up. 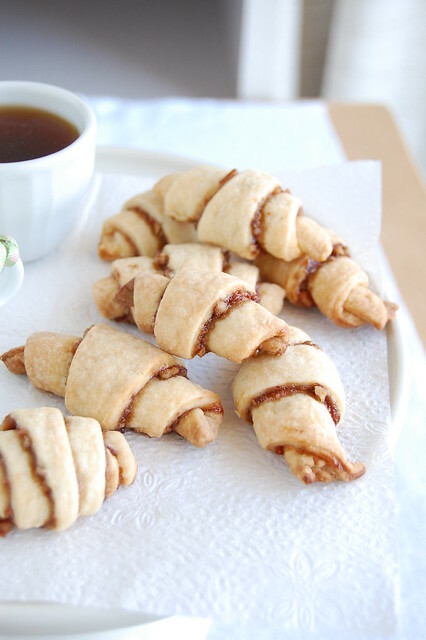 Do not roll the rugelach too tightly or the jam and filling will ooze out. Keep the outside of each cookie free of the jam and filling, or they’ll tend to burn. 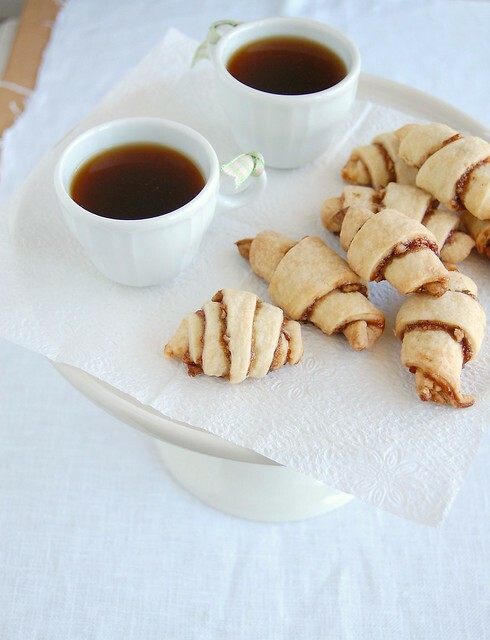 Wipe your fingers clean after making each rugelach, or you will transfer the sticky interior of the last cookie to the exterior of the next one. Place each rugelach on the pans about 2.5cm (1in) apart, with the point of each facing down. Curve the ends of the rugelach slightly toward the point to make a crescent. Repeat this process with the other two disks of dough.